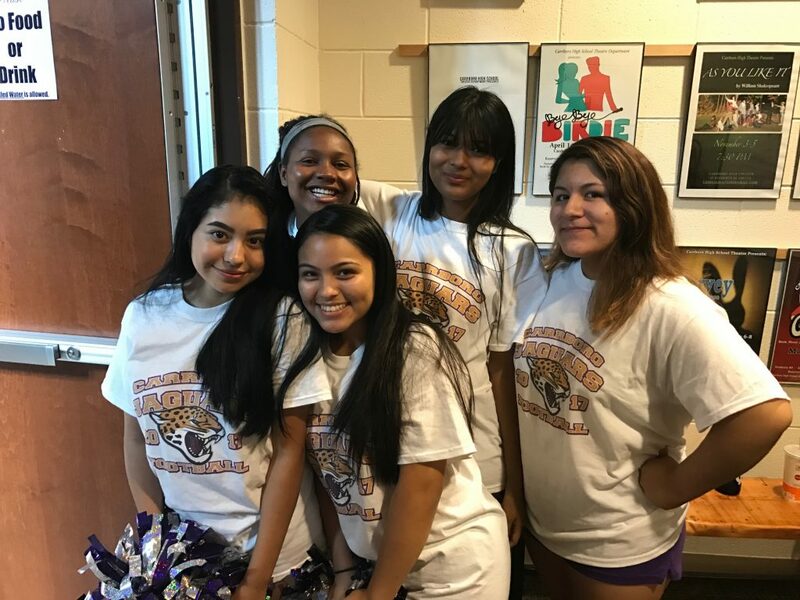 The Class of 2021 experienced Carrboro High for the first time today, August 25. Around 11:00, students and their families crowded the school’s entrance to attend Freshman Orientation. Junior Advisor Guides (JAGs) greeted the students with signs. 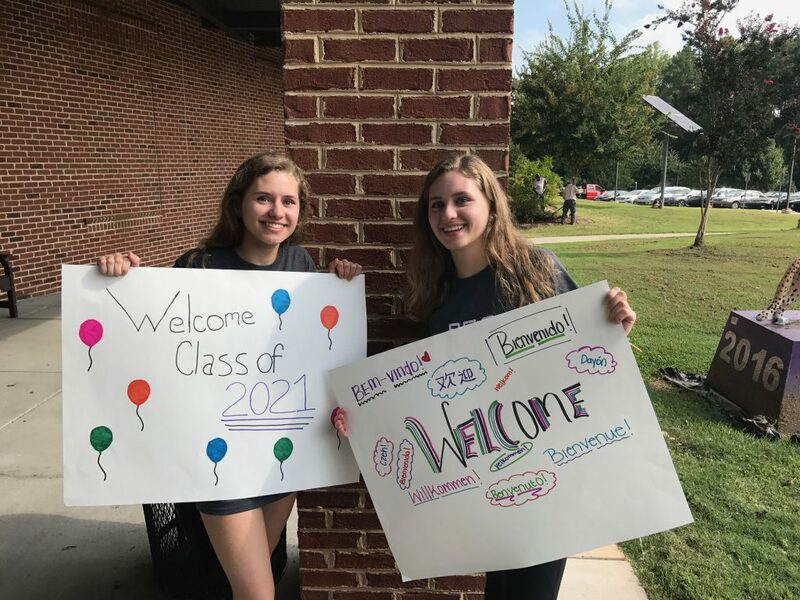 Junior Advisor Guides (JAGs) welcomed the Class of 2021 at the school’s entrance. 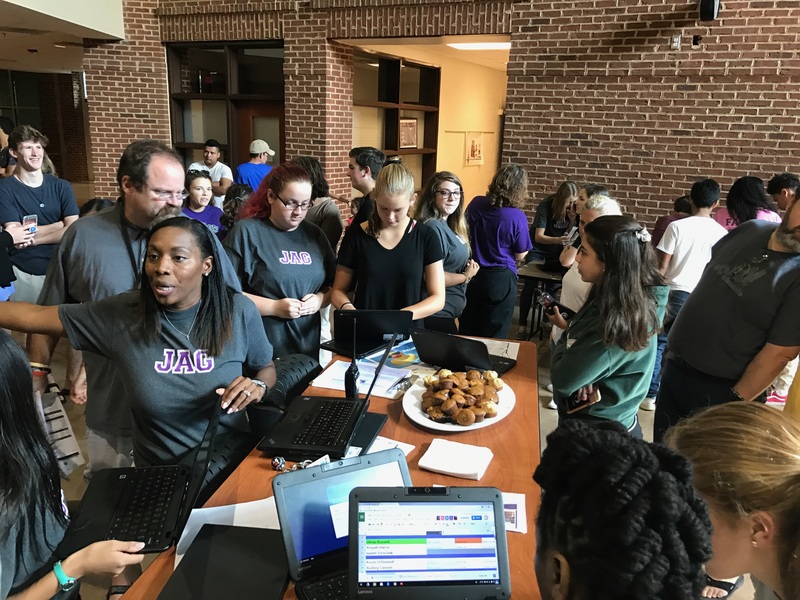 Event organizers, including students, faculty and other volunteers, ushered the newcomers to sign-in tables where seniors (SPOTs) provided instruction. Students then headed to the auditorium for presentations while parents had the opportunity to buy C-Town spiritwear. Once inside the auditorium, JAGs greeted their assigned freshmen with large signs. Cheerleaders also lined the auditorium entrances to show school spirit. The cheerleading team showed their spirit as they welcomed students into the auditorium. The presentation was a chance for the new principal, Beverly Rudolph, to welcome students and establish herself as the face of CHS. In response to recent events in Charlottesville, she reminded students that hate has no home in CHCCS. “You have freedom of speech until that speech becomes hate speech,” said Principal Rudolph as a reminder. After student and faculty presentations informing students of various opportunities, including student government and athletics, students took a tour of the school. Event organizers hope Freshman Orientation gave students some familiarity with CHS before they begin high school next Monday.